Sister Miriam Theresa (originally Caroline J. Gleason) helped shape Oregon’s social justice movement in the early 20th century. Born in 1886 to politically active Roman Catholic parents in Minneapolis, Minnesota, Gleason earned her bachelor’s degree and a teaching certificate at the University of Minnesota. Upon graduation in 1908, she moved to Portland and joined the faculty at St. Mary’s Academy. 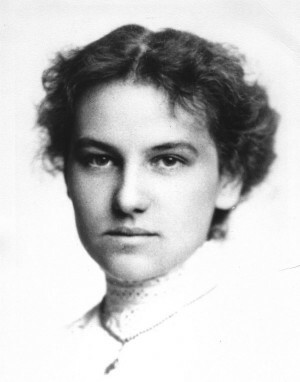 She did graduate work at the Chicago School of Civics and Philanthropy, and in 1912 was hired as the field secretary for the Catholic Women’s League in Portland. In 1912, the Oregon Consumers League asked Gleason to organize a staff to survey women’s working conditions in Oregon’s factories, stores, and offices. Those findings became the data for Oregon’s passage of the nation’s first minimum wage and maximum hour law in 1913. The law created a new agency, the Industrial Welfare Commission, and Gleason became its first executive secretary. Gleason became Sr. Miriam Theresa when she joined the Sisters of the Holy Names at Marylhurst, Oregon, in 1916. In 1924, Sister Miriam became the first woman to receive a Ph.D. from the School of Social Work at the Catholic University of America in Washington, D.C. She continued teaching at St. Mary’s Academy until 1930, when the Order opened Marylhurst College and she became the dean of the Sociology Department. Her doctoral dissertation on the Oregon labor movement was published by the U.S. Department of Labor in 1931.She died at the Marylhurst convent of the Holy Names Sisters on May 12, 1962, at the age of seventy-six. The Sister Miriam Theresa (Caroline Gleason) Papers consist of documents relating to Caroline Gleason’s minimum wage law research and career prior to entering the Sisters of the Holy Names of Jesus and Mary (1913-1916). As Sister Miriam Theresa, the documents chronicle her life as a professor of social work (1937-1959) and her participation and interest in various groups related to social work and social justice (1916-1962). This collection comprises 6.51 cubic feet of documents and photographs. Her papers are part of the Archives of the Sisters of the Holy Names of Jesus and Mary, U.S.–Ontario Province. Begun in 1859 with the sisters’ arrival in Portland from Quebec, the archives chronicles the lives and work of the Sisters of the Holy Names of Jesus and Mary as elementary, secondary and college educators in Oregon, Washington, California, New York, Maryland, Virginia, Washington, DC, Florida and Ontario. The sisters operated both parochial and their own private schools and universities, several of which still operate today. Records pertaining to the community’s governance, schools, convents and individual sisters are among those available for research. The collections are comprised of documents, photographs, sound and film recordings, and art in a variety of mediums. Of particular note are the chronicles, or daily logs of convent life, that were kept in each convent from its foundation. These often contain reference to current events, including suffrage and the world wars.